This year, why not spend a little extra time and effort creating the perfect escape for your partner ? at home? 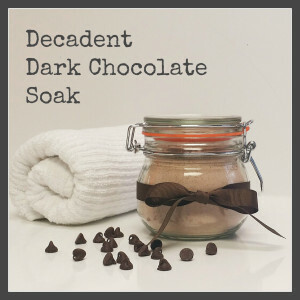 With a little effort you can have your partner oohing and ahhing over your unique, made-by-hand bath-time treats! We’ve come up with a few ideas for treating your special someone to a relaxing afternoon or evening at home. So take a look and try a little something new this year! If we’re all honest, not many of us make the time to relax in a warm bath. In fact, for most people, especially moms, soaking in a tub is a non-existent luxury. For me, relaxing in a warm bath wipes away the worries of the day. There is something about floating in a warm bath that makes the world right again. Just thinking about it brings my mind and body peace. And that’s a pretty good (and much needed) thing. 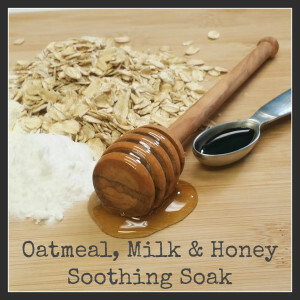 Below is a few simple, DIY recipes for soaks sure to please the one you love. And all of the different variations are all made with items in your kitchen! P.S. 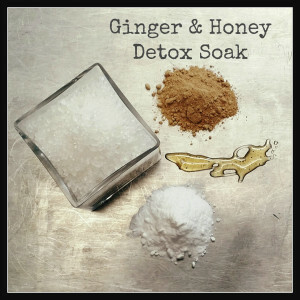 If your special someone isn’t “into” soaking in a tub, the DIY recipes below work great as a foot soak too. And they will work fantastic with our DIY Massage Cream recipe listed below. Directions: Mix all dry ingredients together and spoon into a pint (two cup) mason jar or other glass container. Apply lid and tie ribbon around neck of jar. To use: Draw warm bath. Display jar and additional per bath ingredients (if listed in recipe above) on a tray. Remember, presentation is key so dim the lights, play soft music, light candles oh…and don’t forget to roll a towel or two on the side of the tub too! Also, if available, leave a soft, clean bathrobe and slippers next to the tub for phase two. Once the water is almost to the appropriate height, allow your loved one to enter the room. Explain the soak you have drawn and pour a cup of the dry soak under warm running water (half of a small pint mason jar) along with per bath ingredients (if listed in recipe above). The remaining fill time will incorporate the soak throughout the water. Turn off water, step out of the room, allow your partner to relax for up to 20 minutes and prepare for step two. Who doesn’t love their tootsies rubbed? Especially after a warm, relaxing soak! You don’t need to be an expert to massage your partner’s feet. Below you will find our DIY Peppermint Foot Balm recipe that you can prepare prior to use. Directions: Measure and mix coconut oil until smooth. Add peppermint EO and mix well. Store in a small jar until use. Preparation: Again, preparation is the key! While your loved one is relaxing in their soak. Prepare the area that you will provide the mini foot massage treatment in. Drape a soft blanket over an over-sized chair (or couch), for their comfort, light candles, play soft music, and prepare their favorite drink whether it be a glass of wine or herbal tea. Tip: Just remember, use somewhat firm pressure and massage with intent, especially on the feet. Otherwise, instead of sighs of relaxation you may just hear giggles. Without enough pressure your relaxing foot massage may feel more like torture. Effort is the most precious thing that a woman wishes to feel. Whenever you exert effort in your relationship, you are showing her she’s worth it. FREE Product Giveaway now through February 13, 2016! Are you looking for a gift to show your loved one you care? 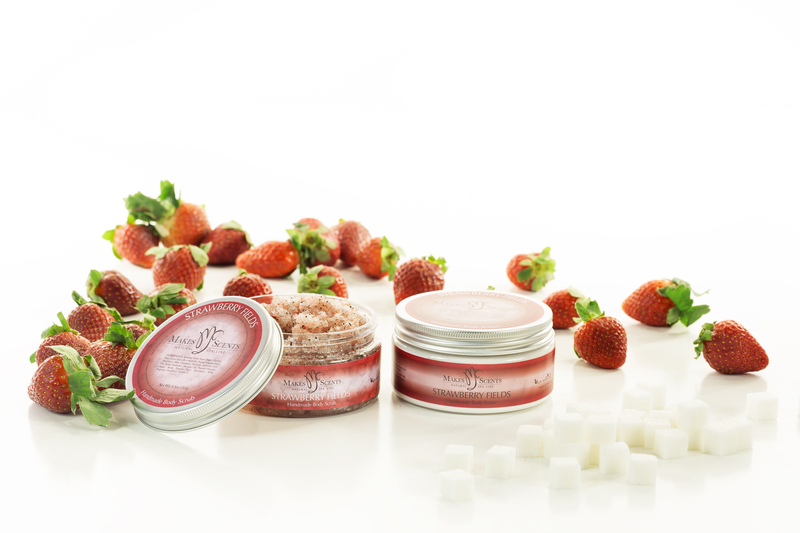 Now through February 13, 2016 receive a FREE Chocolate Lip Balm with the purchase of our 7-ounce Strawberry Fields Body Butter. And wrapping is included! Visit our website more great gift ideas such as our Chocolate Covered Strawberry Collection (Strawberry Fields Body Scrub & Chocolate Decadence Body Butter), or our Caramels & Crème Collection (Dulce de Leche Sugar Scrub & Oatmeal, Milk & Honey Body Butter) or our Peppermint Hot Chocolate Collection (Mocha Mint Cappuccino Body Scrub & Chocolate Decadence Body Butter).